Yeah…I took out the quotes and I’m good to go! Feel free to cruise by http://www.jenniferhansenscrapgallery.blogspot.com! Congrats Jennifer! 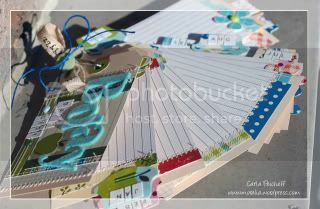 Please contact Allison with your mailing details at scrapbookandcardstoday@live.com. Stay tuned.... we haven't finished our cruisin' just yet!!!! Click here to find out how you can play and have a possibility to win too! Good luck! Just a reminder.... the Winter Call for cards, layouts and other crafty projects is up. Come and check out all the details here. 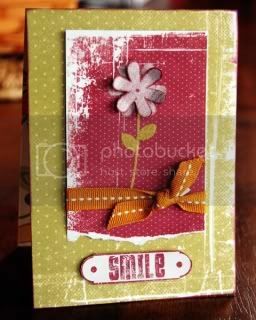 To check out loads of inspiration from the Stamping Bella website, and to see all of the other great new products visit www.stampingbella.com. And luck comment number 45 belongs to.... Regan!!! ooooh, love these- fingers crossed~! Congrats Regan! You are the lucky winner of last week's Bo Bunny goodies! Please contact Allison at scrapbookandcardstoday@live.com with your mailing details. What a great idea! This birthday list mini-album is perfect for all of us who need a little help remembering birthdays of multiple nieces, nephews, aunts, uncles, friends, etc. Adorable, compact, and practical, we just had to feature this book by Carla Peicheff of London, ON. Today, Kimber is going to show us a beautiful card that she made using the Foil, Glitter, Flock from We R Memory Keepers. This versatile product has the same steps for all 3 mediums (the foil, the glitter, or the flock). This card features the flock. 1. Cut out the special rub-on from the package. Designer Tip: I cut through the packaging too instead of pulling out the rub-on sheet and putting it back in after I am finished. It's just easier for me. Note: for this project, I cut the flower off the stem so I could do 2 different colours of flock. 2. 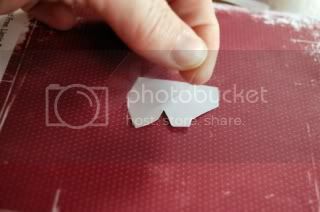 Remove the protective backing carefully. DO NOT TOUCH THE RUB-ON—they are VERY sticky. 3. 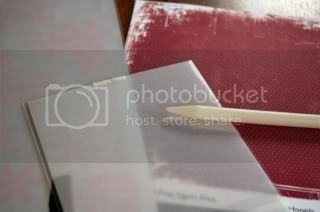 Place the rub-on sticky side down on your paper and burnish with the stylus until the rub-on releases. 4. 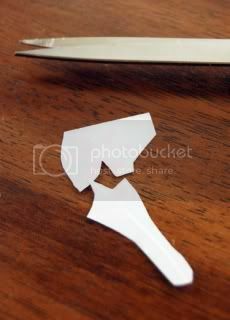 Carefully remove the plastic sheet. If the entire image hasn't released, carefully place it back down and continue to rub. The special rub-ons are sticky on the top to be able to accept the flock, foil, or glitter. 5. Place the fuzzy side of the flock sheet down on the rub-on. (for the foil, the shiny side goes down, and for the glitter, the sparkly side goes down). 6. 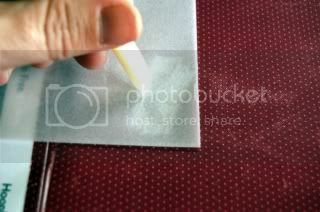 Using your stylus, rub the flocking into the rub-on. RUB HARD and in different directions. 7. Pull back the flocking sheet. If you haven't completely covered the rub-on, place the flocking sheet back down and rub some more. 8. Repeat the process with the stem using the green sheet of flock. These are so fun and fuzzy when complete. They add that extra bit of texture to your projects. Our new favourite solution for storing ribbon is the pull-eez. It comes in a variety of colours and sizes, has a huge storage capacity, and it is portable! You can check them out at www.stor-ez.com . We also love the new ribbon organizer from Clip it Up. It has built in scissors at both ends, is streamlined, and comes with wall-mounting hardware. Check it out at www.clipitup.com . The ribbon ring (www.ribbonring.com) is a brand new product. 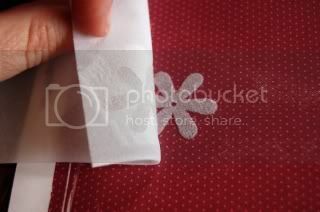 It features a series of tags that your ribbon gets threaded through and then the tags are hung from a metal binder ring. The rings can be hung from the wall and this neat system prevents ribbon from getting tangled and ensures that your ribbon is never more than a snip away. Cropper Hopper has had great products on the market for a while now. Their ribbon spool drawer is handy and efficient. Visit them at www.cropperhopper.com for more info. 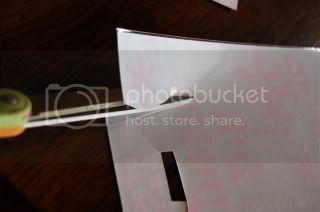 Several manufacturers have stackable storage boxes for ribbon available. 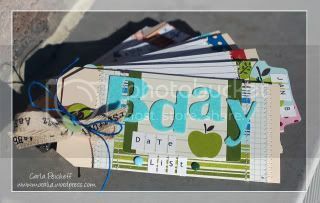 Check out the ones from Stampin’Up!, Crop in Style, and Martha Stewart Crafts. Other solutions we’ve seen include some of the following: store ribbon on a vintage paper towel holder; on a piece of doweling (purchased from a DIY store like Rona or Home Depot); in a multi-sectioned container used to store embroidery floss or in a tackle box; in a 3-ring binder complete with clear plastic sleeves (like you would use to display hockey cards); wind ribbons around wooden spools or clothespins, affix end with a pin, and fill a glass cookie jar with the spools; wrap ribbon lengths around strips of cardboard and then display in a basket; organize ribbon by colour in clear, glass jars. We hope you have found one or more of these solutions helpful. 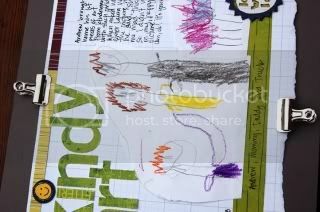 Make a layout that incorporates your child(ren)’s art work. Here is what I did: To scrapbook the large paper, I asked him to cut out the drawings and I adhered them to my page. 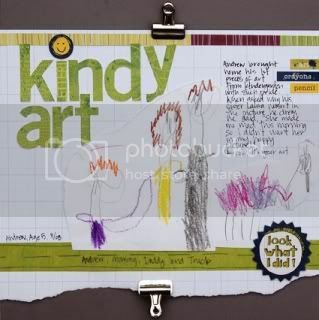 Some other options for including your child(ren)'s art on a scrapbook page would be to either scan it in, take a photo of the art, or even take a photo of your child holding their masterpiece. I used a piece of grey cardstock, as well as some clips on this page to make it feel like the art was hanging on the refrigerator.